Favorite Fabric? Are you kidding? Is it fabric? It’s my favorite. There’s the hand-woven handkerchief made by a friend that is my absolute favorite textile accessory. 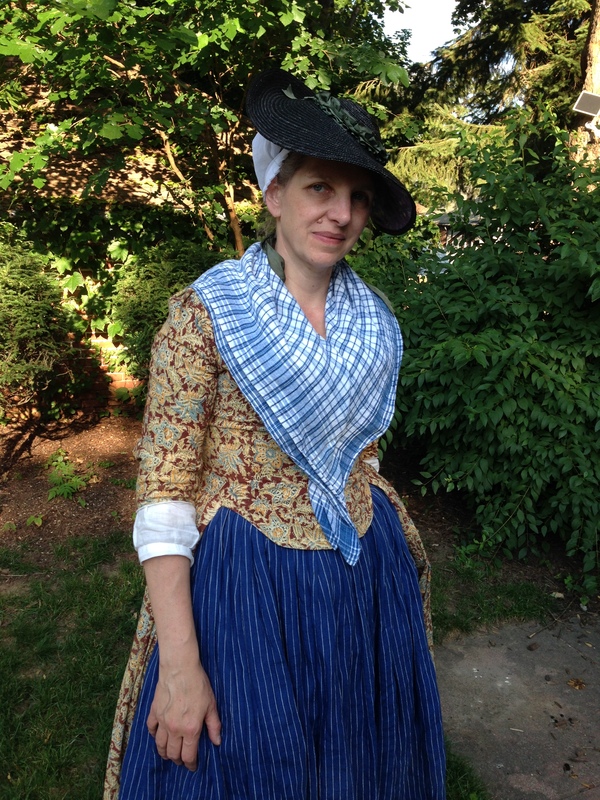 There’s silk taffeta, and the occasional silk satin, for bonnets. And linen for shifts and linings. But my all-time favorite fabrics are Indian block print cottons. I have multiple yards in storage, and multiple yards in the accessible Strategic Fabric Reserve. I try not to look at them in the online shops, for I cannot afford to be tempted. And the somewhat noticeable Nancy Dawson. It was hot. And humid. That’s only water. There’s an early red, white, and black calico based on a Philadelphia runaway ad, too, and though I’ve not had it on in a while, it may be due for a renaissance. 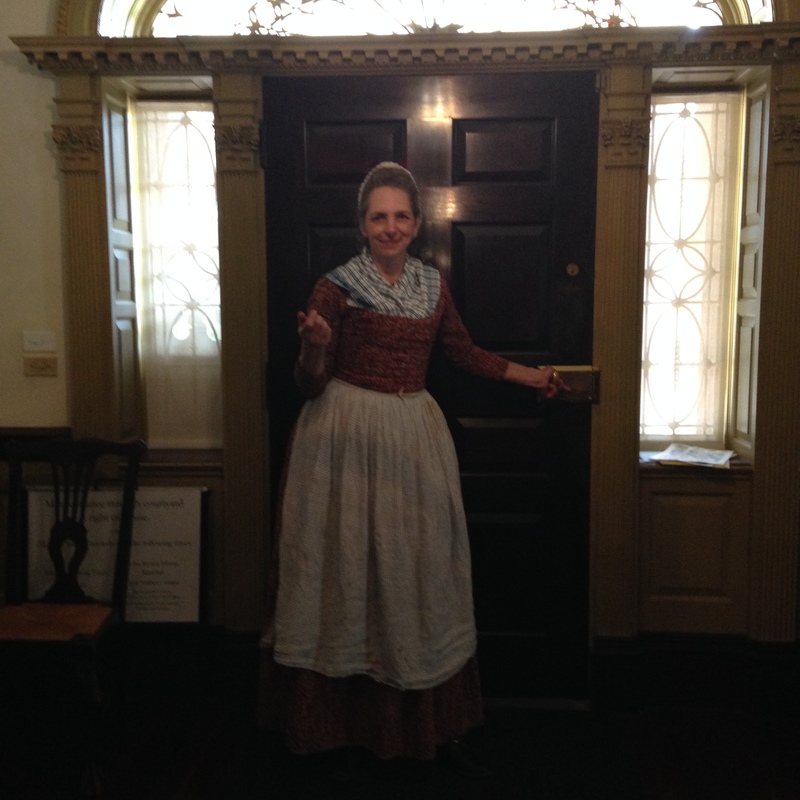 Oh, and while it requires some shoulder strap adjustments, there’s the brown Indian print I wear as a unsatisfactory Philadelphia servant and Boston sight-seer…and the red print I wore for a 1790 Providence housekeeper. how does she get hired? So, yes, pretty much my favorite, and of the prints? Nancy Dawson, hands down, though I was skeptical at first, for the yellow was so very bright. Made up and worn, though, I love it. 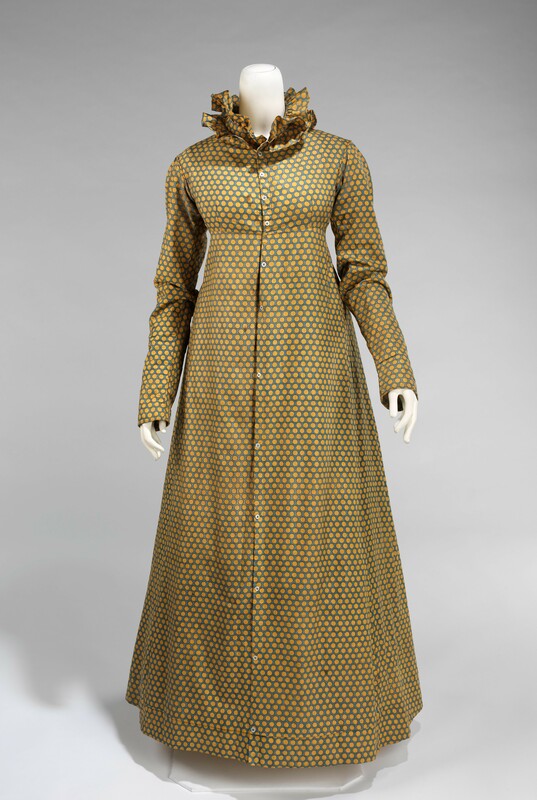 Lately, I have developed an obsession with this roller-print day dress from the Greene Collection At Genessee Country Village Museum. I first encountered it on the 19th US Infantry’s website, a haven for those of us consumed with the early Federal everyday. The 19th US site provides more photos and a drawing of the dress, so that if one were to become impossibly obsessed with the dress, one could recreate it. And if one were up late nights, one might consider how to create a copper-engraved roller for printing cotton. A more productive line of thought might be to consider this fashion plate, found during an early-morning Pinterest session. I think it gives us a sense of how rapidly fashion crossed the Atlantic (just as quick as engravings could be printed and bound into magazines, and boats could make the trip), and how avidly women copied the latest fashion. 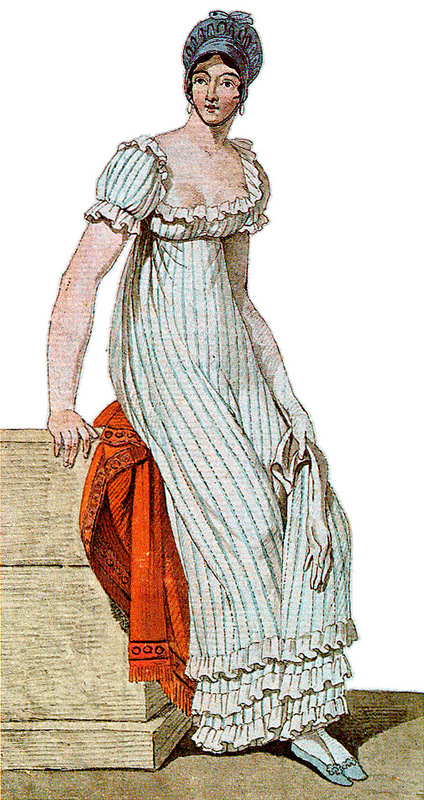 That avidity would have been tempered by access to fabrics, but the resemblance between the dress at Genessee and the fashion illustration is striking, indeed. In typical museum fashion, whilst looking for something else, I found something I didn’t know I wanted. I’ve been asked to portray an 1812 milliner in Salem this coming August (which feels like next year but will soon be Ohmygoodness that’s TOMORROW) so I’ve been getting a start on images of bonnets and hats and gowns and things because you know I’ll have to have something new. Have to. And there at the Met was this garment, unassuming and bronze-looking in the thumbnail of catalog hits and ever so much more so when you get up close. I recommend getting quite close to really appreciate the print. I’m pretty sure I’ve seen something similar in the quilting cottons, Amy Butler or Kaffe Fasset, and of course I’m tempted. Wouldn’t you be? How often do you get to mix historic costumes and Op-Art? Mostly only if you’re a textiles curator at the MFA, where you should check out the Quilts and Color show if you get the chance.